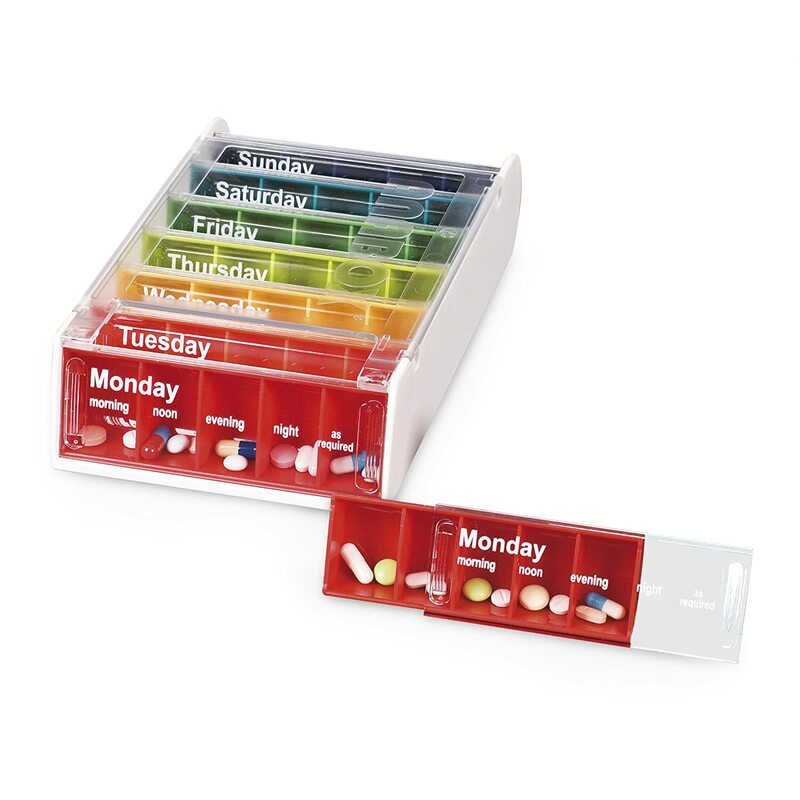 The Anabox Weekly Pill Organiser is made up of 7 daily pill dispensers combined into one easy to manage frame. Made of high quality plastic the Anabox is sturdy while also being easy to use and not as fiddly as many alternatives. The Anabox Weekly Pill Dispenser is made up of seven individual pill containers with a rounder semi-circular rear side, this allows the boxes to be slid in and our of the Anabox frame seamlessly. The sturdy frame is toped with clear plastic allowing you to easily see each compartment. Each of the seven internal dispensers is tilted to be viewable at a glance. The pillbox is very well made and easy to use offering a clear guide as to what tablets should be taken when. A lot of other styles of pill containers can be fiddly or difficult to open, this is not the case with the Anabox. The design allows the container to slip in and out easily while remaining secure when not in use pills are also easy to insert or remove. The Anabox is Stackable, and Dishwasher Safe. Avalible in White, Blue, Turquoise and Rainbow colours. 12 months parts and labour warranty included. Free is provided for this Product. VAT Exemption is available for this product if you have a long-term disability or medical condition. Please contact us after you place your order so we may obtain the name of the long term medical condition or chronic illness that the user if the item suffers with. VAT Exemption applies if you suffer from a valid medical exemption condition or are purchasing on behalf of someone who does. If you do not have a valid medical exemption condition you will be required to pay VAT. We believe in Great products, Great customer service and Great prices. We always try and offer the most competitive price for lines we carry, if you find a product online in the UK for a better price let us know and we will do out best to match or beat it. The competitor must be a valid online UK retailer and provide products direct to consumers, we are not able to award a price promise against any marketplaces such as eBay, Amazon, Play or from any third party resellers. The competitor’s product must be a like for like product. Same model, colour, size etc. The competitor’s product must be in stock at the time the Price Promise is awarded. The competitor’s price must be inclusive of all delivery charges for the Price Promise to be awarded. The competitor’s product must be publicly advertised online at the time the Price Promise is awarded. The competitor’s product must not be part of any promotional activity specific to their outlet, e.g. we are unable to award the Price Promise if the item is included in a clearance, sale, buy one get one free offer or any other discount that has been applied to the product. A Price Promise cannot be used in conjunction with any other promotional offer that we have running at that time. V&A Healthcare offer wholesale and drop shipping on a wide range of product from Clothing to Mobility Scooters. V&A Healthcare is in a unique position to offer many exclusive lines as well as our very own products. We offer great prices and can drop ship direct to customer with your brands invoice. Click the button below to add the Anabox Weekly Pill Organiser to your wish list.